As-salamu alaykum It's a greeting in Arabic meaning "Peace be upon you" My name is Achraf. This pass associated with my backround and my professional experience will offer you a guide with very special skills. Not only in the context of guiding but also with a sense of organization, mastering the principals of excellent service and customer satisfaction. Hello! I am Ahmed Taoumi and I work as a private guide in Tangier. I was born in this remarkable city and that’s why I want to share its matchless culture and glorious history with people from other countries, belonging to other nationalities. Here are some words about my education. Morocco lures thousands of tourists with its unique Arab and African exoticism, excellent beaches of the Atlantic and the endless Sahara desert. Officially known as the Kingdom of Morocco it is situated in the most westerly part of the North African countries. It is worth noting that Morocco is one of the three countries that are lucky to have both Atlantic and Mediterranean coastlines, the other two being France and Spain. Moroccan rich culture is considered to be a blend of Berber (indigenous African), Arab and other European and African influences. Morocco is one of the few countries where you get an opportunity to experience traditional Arab exoticism without sacrificing your comfort and well-being. Besides that, the Moroccans are famous for their hospitality and tourism industry is on its rise here. Among the most popular tourist destinations the following cities should be mentioned: Agadir, Marrakech, Essaouira, Casablanca, Fes, Tangier, Oualidia, and El Jadida. Morocco is especially favoured by surfers seeing as it has several specialized beaches. They say it is a must to ride on a rough Atlantic wave somewhere in Agadir. It is also advisable to get lost in a maze of old streets of Fes. Hello! My name is Jonas and I am a Moroccan nomad. I was brought up in the heart of the ruthless desert and high Atlas Mountains. I am a descendant of a traditional Berber family of nomads. Normally I live in the desert or in the mountains, when it’s not too hot. Due to my special way of life I have seen Morocco in every detail, and there is no such place that I haven’t seen, and such question that I won’t be able to answer about Morocco, its rich culture and glorious history. Hello! I am Mohammed Merrouch, I am the private guide in Morocco and I offer different kinds of tours. I try to be very interesting and funny person so tourists could spend their vacation not only with benefit but also with fun. Since my childhood I was involved in the tourist industry: my father had been invitng many tourists in our home to show them our daily life, to let them taste our local cuisine, and have a sip of our famous Moroccan Mint Tea. Greetings from sunny Morocco! You should definitely join our private tours in Marrakech, and get acquainted with exotic Moroccan culture, learn about the glorious history of Morocco, experience something new for you. Our travel agency offers the service of high level private guides in Morocco. By means of our tours you will be able to experience the legendary Moroccan hospitality and generosity. We offer only personal private tours, which are meant to help you explore Morocco as an insider. You won’t have to put up with the rigid schedule of the customized commercial tours. Hi, there I provide tours in English, Italian, Portuguese, Spanish, Arabic, and French as I could also offer different tours in Morocco; city tour or the imperial cities, but the most exciting tour that we have is the grand tour; starting from Fes to atlas mountains to Sahara the vestiges of a past age and of unique ways of life, kasbahs, ksour and granaries. . .
My name is Abdellatif Bougoula and I was born in El Attaouia, a small town east of Marrakech. As a young adult, I attended the Kadi Ayyad University, where I completed my Bachelor's Degree in English and literature. After graduating, I worked as an English teacher in the village of Midar near Nador city, which is in the North East of Morocco. My name is Muhammad and I’m a private tour guide operating in Tangier, Assilah, Chefchaouen, and in different places throughout Morocco. I offer Tours according to the customer’s needs and budget, including walking tours, sightseeing tour, cultural visits, hiking, shopping tours. My name is Abdelmoghit. I was born in the old town of the beautiful city Tangier. I grew up influenced by many different cultures and the spirit of this cosmopolitan city which is characterized by being partly African and partly Mediterranean. This multiculturalism shaped my character and my peronality. Greetings from Morocco! We are a professional team of private guides in Morocco. We provide a wide range of private tours in Tangier. It is worth noting that we have an individual approach towards each and every of our clients. It means that it we can discuss the itinerary beforehand and come up with the best possible variant personally for you. We will try to accommodate you and change the itinerary depending on your preferences and possibilities. Hello! Join Idriss private tours in Morocco, and you will be able to learn a lot of interesting facts about Moroccan traditions, and you will find out why Moroccan generosity and hospitality are known world-wide. By means of our private tours, you will get all the information you need and get acquainted with the Moroccan culture and glorious history. We offer only personal private tours, which are meant to help you explore Morocco as an insider. Greetings from Morocco! We are a team of professional private guides in Morocco. We offer a wide range of private tours in Casablanca. Our travel agency has an impeccable reputation and we have been working in tourism domain for more than ten years now. We work with various holiday operators from Morocco and from Spain. Guides are required to possess a license issued by the Ministry of Tourism in order to provide respective services in Morocco. Not complying with the request to show a valid license upon request may result in a substantial fine and deportation, if the person is not a citizen of Morocco. In general the license can be obtained by any legal adult person living in Morocco and having a diploma in tourism upon completing respective courses and passing the exams. Nevertheless, there may be different requirements towards solicitors in different parts of the country, so you should always check for details. 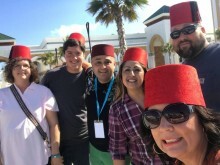 Morocco has become a rather popular destination for different types of tourism over the last several decades, so there’s always a demand for guides, who are able to service tourists from different countries. That’s why the requirements towards license solicitors may be less rigorous than in European countries. Furthermore, there are many qualified tour guides working without a valid license in Morocco for years. Nevertheless, it’s a serious risk that isn’t recommended to be taken. So if you really want to work as a tour guide in Morocco, it’s suggested that you either get a license or get hired by a tourist company.